Hindi is my first love. Yes, I mean it! And this blog is a dedication to my Hindi teacher and is exclusively for Hindi content. The last poem I wrote- 'SWARGAZA'- got a very good response in certain communities, something I had never imagined. A group of doctors working at very good positions in the field of Public Health (which also happens to be my area of specialization) offered to send this poem to health professionals working in Gaza for its message and impact, provided I translate it to English, as the populations there read primarily Arabic and English. The message is to see truth as it is, to end war, spare innocent lives and understand that an eye for an eye can make the whole world go blind! I hope these words reach far and wide and bring about a positive change in some corners of the world. Hence, I choose to translate it to English and feature it on my blog as an exception. 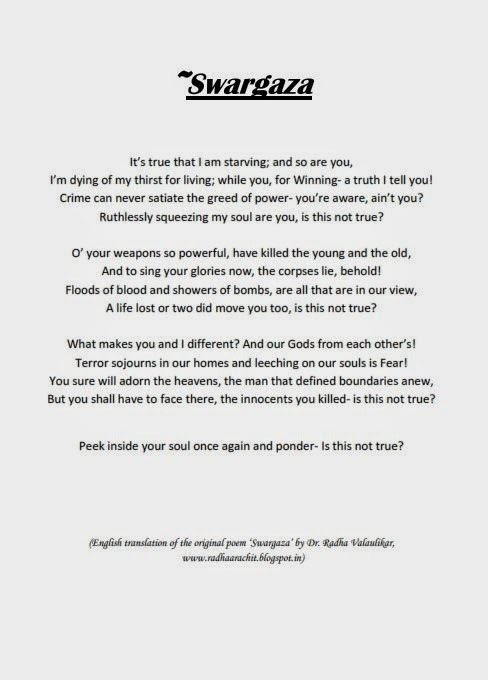 A request to those sharing this poem- do not violate the copyrights. A lot of effort goes in writing the posts. Thank you. I wish and pray that may your poem reach Mr. Benjamin Netanyahu's desk.